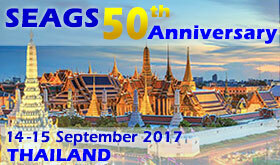 500 participants from 23 countries. The Honourable Minister of Housing and Local Government of Malaysia Dato’ Ong Ka Ting who was the guest of honour, declared opened the 3-day Conference with one day of site visits. Professor Pinto; Professor Madhav and Professor K. Y. Yong, the President of the Southeast Asian Geotechnical Society (SEAGS), Datuk Paduka Engr. Keizrul Abdullah, President of the Institution of Engineers, Malaysia, Dato’ Ir. Annies Bin Md Ariff, Deputy Director General of Public Works Department, Malaysia, gave their addresses at the conference. This Conference has one Opening Keynote Address, one Chin Fung Kee Lecture, 8 Keynote Lectures, 4 Special Lectures, 5 Special Session Lectures and 11 technical sessions with about 130 papers. 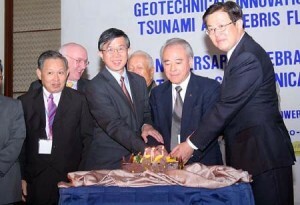 The theme of the Conference is “Geotechnical Innovations in Practice, Tsunami and Debris Flow”. A forum on the conference theme was held before closure of the conference technical sessions. There were active discussions from the floor. Post conference proceedings will be published in due course. All participants are encouraged to send in their discussions within 3 months from the date of the close of the conference. A farewell Banquet was held with cultural performances on 10th May 2007 to reward the Keynote Lecturers, Special lecturers, authors, participants and others who have in one way or another contributed towards the success of the conference. A cake cutting ceremony was also held at the banquet to celebrate the 40th anniversary of the Society. The President and Vice President of Asia of the ISSMGE took active part in the conference sessions, meeting with SEAGS Council Members and participated in the ISSMGE Technical Committee meetings. 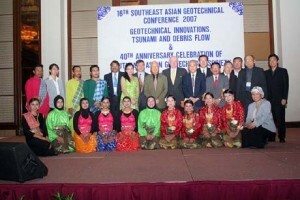 This Conference is jointly organized by the SEAGS, the Institution of Engineers, Malaysia (IEM) and the Public Works Department of Malaysia and supported by Construction Industry Development Board of Malaysia, Nehemiah Reinforced Soil Sdn Bhd, Tourism Malaysia, Konsortium LPB Sdn Bhd, TenCarte (Malaysia) Sdn Bhd, Keller (Malaysia) Sdn Bhd and many others including the Institution of Engineers, Hong Kong. The registration fee was kept at very affordable level so that all those who wish to attend the Conference could benefit. In recognition of the contribution from the authors of papers, very special rate has been accorded to them. The hard bound Conference proceedings containing about 1000 pages, the 40th Anniversary Commemorative Volume of the SEAGS and the bound volume of the Professor Chin Fung Kee Memorial Lecture Series 1991-2006 were given to all participants. The General Committee of the SEAGS decided at its meeting that the next SEAGS Conference will be held in Taipei City in 2010. The meeting also elected Dr. Chung-Tien Chin as the New President for session 2007/2010. Dr. Teik-Aun Ooi was elected as the Protem Chairman for the proposed formation of the Association of Geotechnical Societies of Southeast Asia. A website has been launched by Prof. Victor de Mello and his family to share with all interested engineers his thoughts and scientific production. Most of his technical papers are already available for free downloading, to be followed by interviews, thesis, some photos and poetry. His family is proud to invite all colleagues to visit and use the site www.victorfbdemello.com.br.